Today's post is actually a result of a conversation that I had with Anneke yesterday about great transition shades that blend out nicely. I started pulling them out and looked at the lot of my favorites and figured it would make a good post. First I should probably specify what sort of shades I'm talking about. These are largely matte shades in various muted colors (fairly neutral) that help blend out a dark crease (but that's not to say I don't also sometimes use these colors in the crease itself) or to sweep into the inner half of the eye under the brow to sculpt the eye area. 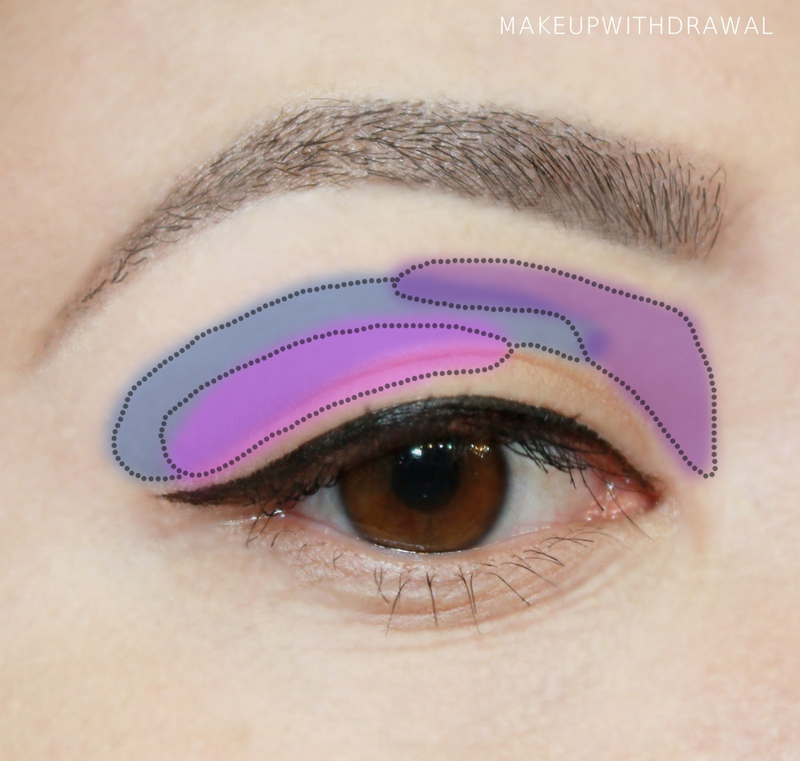 In the pictures above, pink is the crease area, blue is the transition space and purple is the sculpting area. Since everyone has different eye shapes, size and structure, these areas may look different on you. In fact, most people might not utilize the sculpting area, I only sometimes blend in that area to give my shallow set eyes a bit more dimension. Here's an example of a transitional shade being used - MAC Wedge outside the crease area, blended into the matte brow color. There's also a tiny bit in the inner eye corner. So these are my favorite eye shadows for this sort of work. I tried to only show you ones that are still available, I think I succeeded. The links will direct you where to purchase. Some of these colors are shades that I would not be drawn to as all over the lid colors. Like Laura Mercier Fresco, a sort of blush apricot with terracotta undertones. Definitely not something that would catch my eye at the makeup counter, it's not really in my comfort zone of eye colors. However, it looks fantastic when blending out darker hues or a contrasting cool crease and it can really compliment my brown eye color. Basically my point is that some of the best transition colors might look drab, dingy or downright slightly dirty looking on their own but you may find yourself reaching for them all the time (MAC Copperplate in particular is a great workhorse). I do realize that most of these shades are mid range in terms of price, and that's not intentional. I just tend to look to certain brands who I know have fantastic quality matte shadows (namely Laura Mercier). I'm confident that you could find very similar shades from Inglot as well as drugstore dupes, it's just that I haven't tried since... I already have these. They exist though, I'm sure of it. Do you have favorite transition shades that you reach for all the time?